The Moonroof Visor also helps reduce wind noise and glare for a more comfortable and enjoyable driving experience. Civic Sedan offers three cloth and three leather interior color options, each bringing its own sophisticated flair to the cockpit. Cloth standard on LX, Sport and EX. Leather standard on EX-L and Touring. 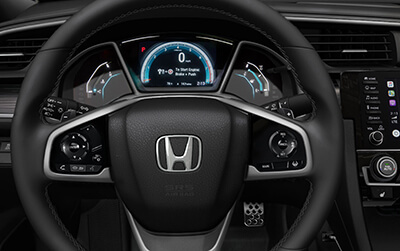 Leather-wrapped steering wheel and shift knob standard on Sport and above. 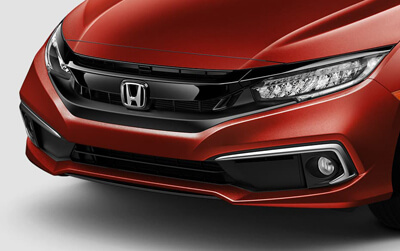 Commencing launch sequence in 3… 2… 1… Blast off in the confidence-inspiring cockpit of the Civic Sedan. 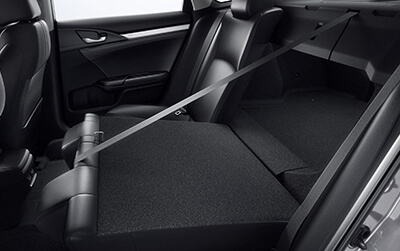 With up to 15.1 cubic feet of cargo space and an available 60/40 split fold-down rear seatback, you have plenty of room to pack it all in and head on out. 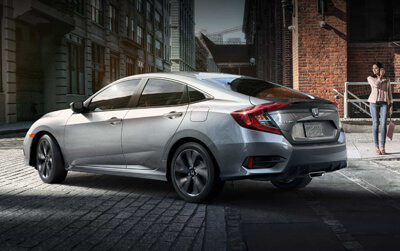 With an available 450-watt, 10-speaker premium audio system, HondaLink® and more, the Civic Sedan keeps you well connected. 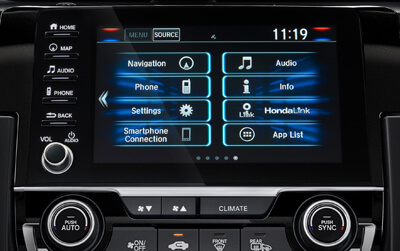 Tap into your iPhone® and get directions, send or receive messages and access your music library all through the Display Audio touch-screen. Apple CarPlay™ standard on Sport and above. 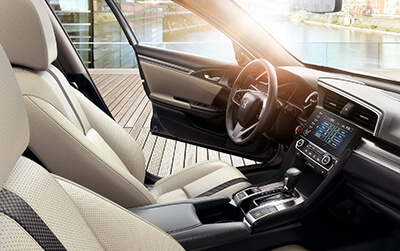 Listen to your music, talk shows, audio books and news with available SiriusXM® Radio and HD Radio™. 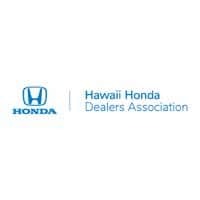 Connecting your compatible mobile device is seamless with HondaLink®, making it easy to start your engine remotely, receive vehicle notifications and even schedule service appointments. 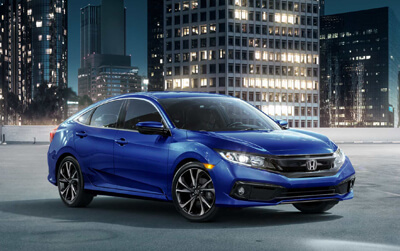 The Civic Sedan offers an available turbocharged engine that produces 174 horsepower and presents a thrilling opportunity every time the light turns green. 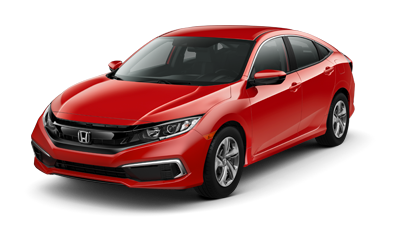 Civic Sedan comes standard with a 158-horsepower, 2.0-liter engine that helped it receive an EPA 38 MPG HWY rating, proving normal is anything but boring. 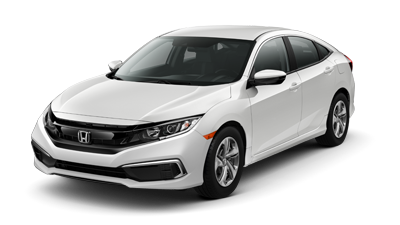 Becoming one with Civic Sedan is easy once you grab the stick shift and make your way through its smooth 6-speed manual transmission. The continuously variable transmissions (CVT) offered in the Civic Sedan were optimized to match each available engine, for plenty of power without sacrificing fuel efficiency. With your hands on the steering wheel, long highway drives are easier with LKAS. 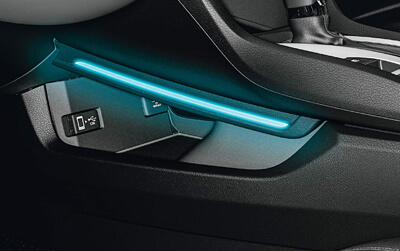 It subtly adjusts steering to help keep the vehicle centered in a detected lane. Young professionals and families alike will gravitate toward the 2019 Honda Civic Sedan, and for good reason. 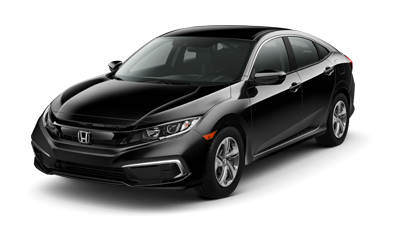 Fun to drive, super efficient, and uniquely styled, the Civic has a reputation for success, whether you’re talking about reliability, safety, or technology. Compact only in terms of category, the 2019 Civic Sedan does a lot with a little. Featuring 97.8 cubic feet of passenger volume (LX) and seating for five, the Civic Sedan is inconspicuously spacious. 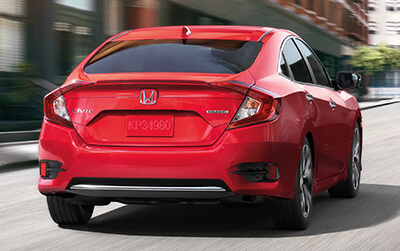 Weekend road trips are a breeze thanks to 37.4 inches of rear legroom and 15.1 cubic feet of cargo space (14.7 cu. ft. in Touring), not to mention various entertainment sources like standard Bluetooth® streaming and a USB audio interface. 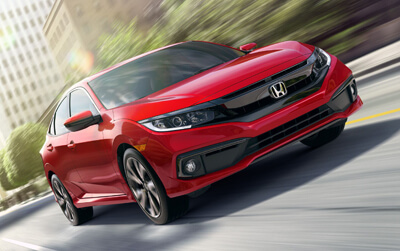 Whether you prefer the smooth-shifting 6-speed manual or the hyper-efficient CVT, the 2019 Honda Civic Sedan makes outstanding fuel economy. 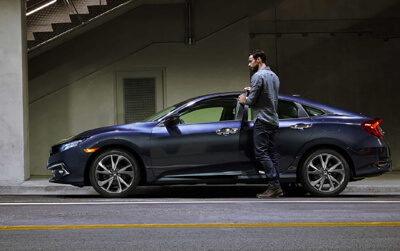 The powertrain brings more choices, including a peppy 158-hp inline-4 or available 174-hp turbocharged powerplant—both capable of impressive acceleration. 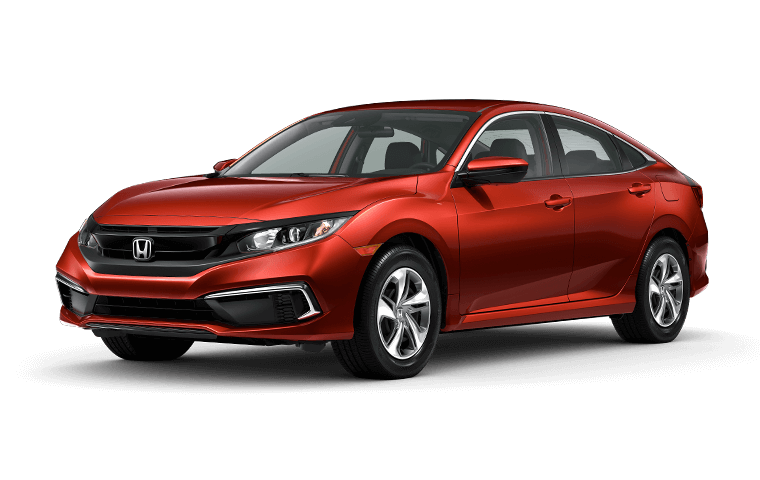 With all of the aforementioned advantages, it’s easy to see how the Civic has earned its sterling reputation.